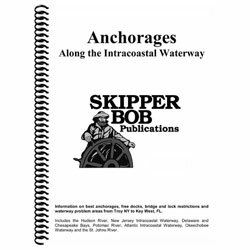 The Skipper Bob - Anchorages Along the Intracoastal Waterway publication covers Troy, NY to Key West, FL. Includes the Hudson River, New Jersey Intracoastal Waterway, Delaware and Chesapeake Bays, Potomac River, Atlantic Intracoastal Waterway from Norfolk to Key West, Okeechobee Waterway and the St. Johns River. features mile-by-mile highlights, including caution notes.